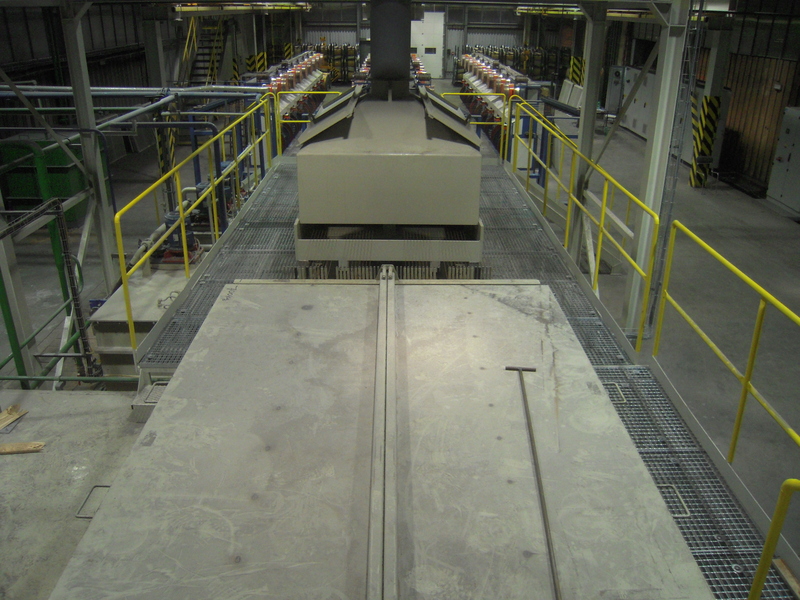 PT /PTM type payoff, rotating platforms suitable to pay-off wire from spools or coils. These unit are particularly suitable for larger wire diameters. SSF-V/VM type payoff, vertical axis flyer type payoff. These units are suitable to payoff wire from spools or coils and can be used for wire diameters ranging from 0.80 mm up to 4.20 mm. The M version is equipped with a motorized pulling capstan in order to limit the tension of the thinner wires throughout the line. SSF-2V/VM type payoff, this unit is similar to the SSF-V but has to payoff positions in order to be able to have a non stop payoff operation. 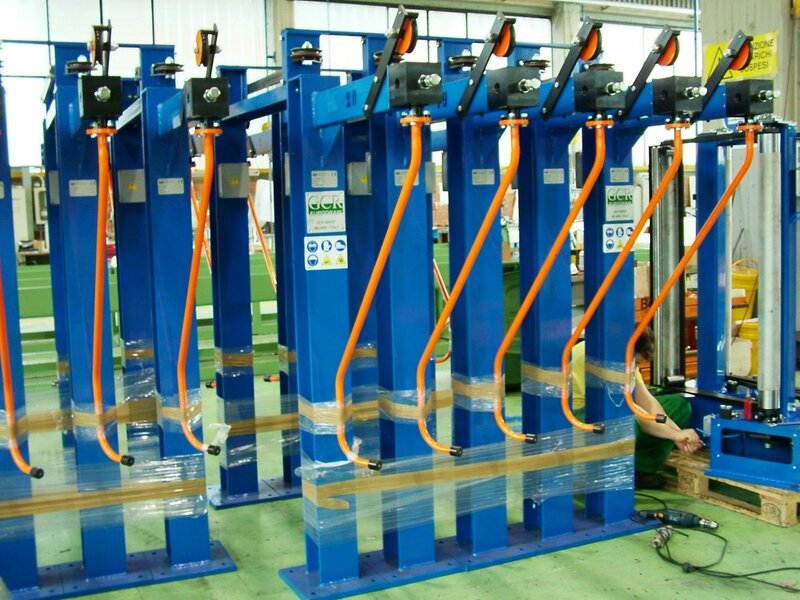 SSF-O, type payoff, this unit is a horizontal axis flyer type payoff suitable for spools only. PT/DB type payoff. 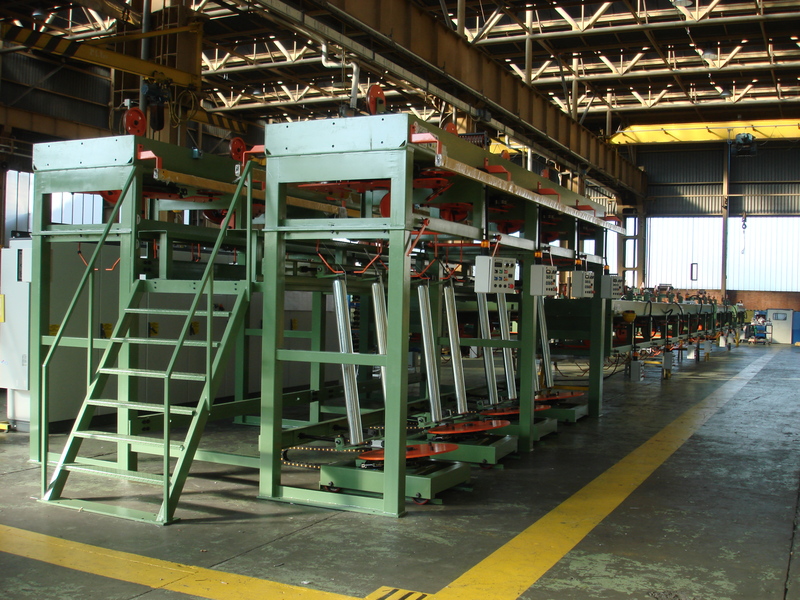 These units are equipped with a vertical axis double block type accumulator and allow accumulation of the wire while the spools is being changed. The accumulator will load itself with wire before the spool ends and when the spool it being changed, will feed the line with wire. 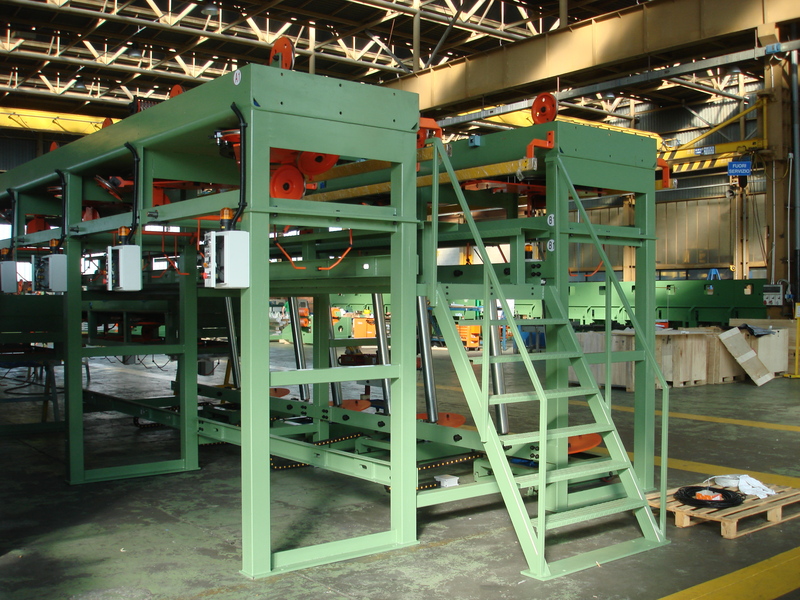 In this unit the spool is mounted with vertical axis on a rotating non motorized platform. Two platforms can be foreseen to speed up the spool change. SP/DB type payoff. These units are very compact and are equipped with an horizontal axis double block type accumulator. The accumulator will load itself with wire before the spool ends and when the spool it being changed, will feed the line with wire. In this unit the spool is mounted with horizontal axis and is positioned under the accumulator. 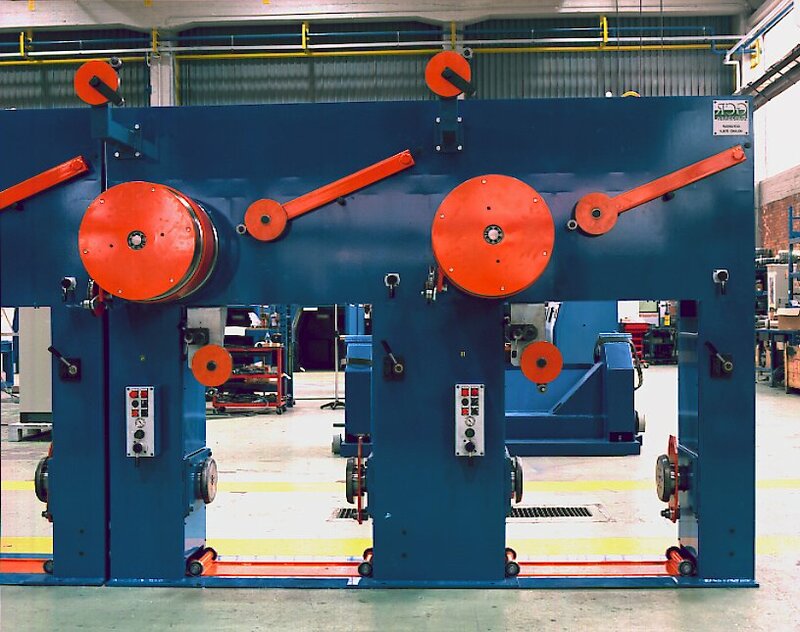 SBW/ SBWM payoffs, these high speed payoff units are specific to bead wire and are equipped with a large pulling capstan and straightening rollers in order to obtain straight wire. The M version is motorized and used in combination with large capacity spools. 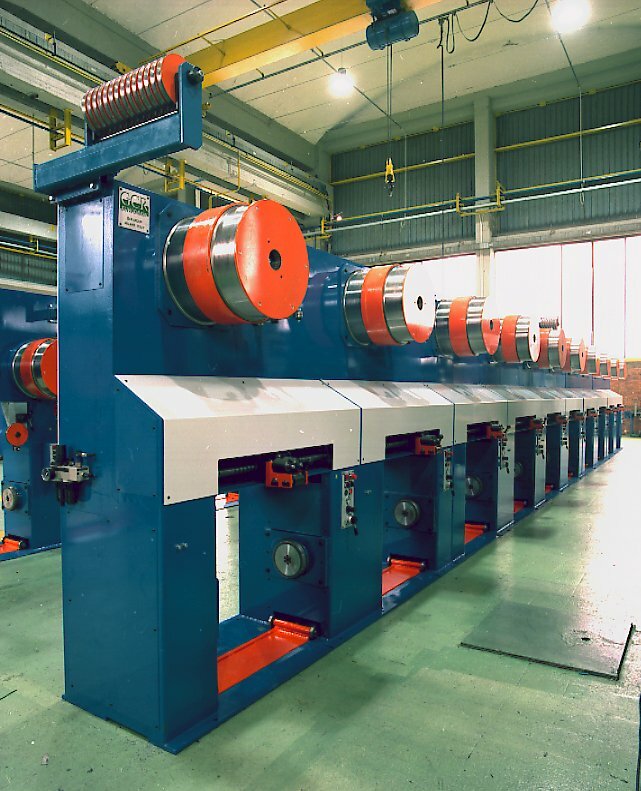 MSV / MSV-R type take-ups: these static coilers are used to produce pattern laid coils of wire. They are equipped with a double straightening unit and can be supplied in various sizes starting from 460 mm in diameter up to 900 mm. The capstan can either be V groove or flat type depending on the application. The MSV-R versions are equipped with accumulation arms and with a motorized trolley. The trolley can be operated pneumatically to extract the coil from under the flyer. 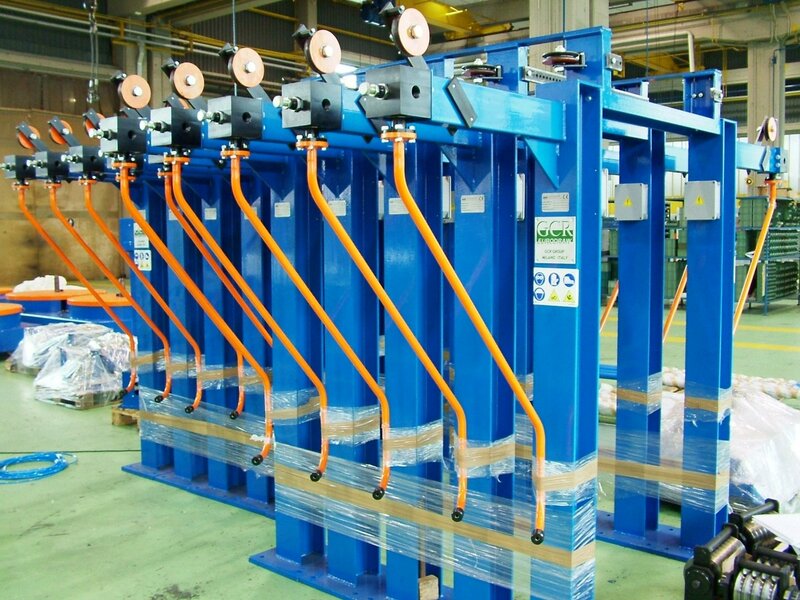 MRV type take-ups: these live coilers are used to produce coils of wire without twist. The coil itself rotates at the same speed of the capstan and winds the wire in the form of a coil. 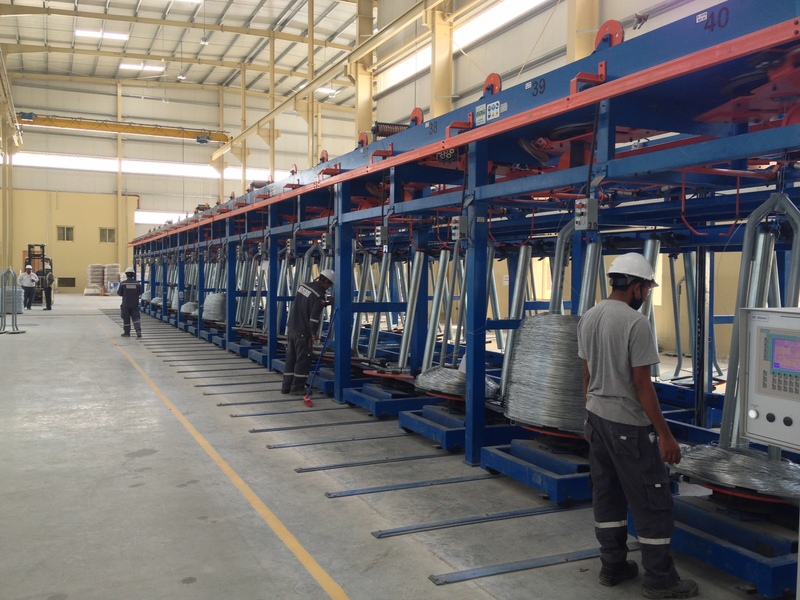 These units are equipped with a special arm that positions the wire wraps in a pattern-laid looking manner. The MRV units can be equipped with a die box for skin passing the wire, especially with stainless steel wire applications and can be supplied with capstan sizes starting from 560 mm up to 1500 mm for oil tempered wire. 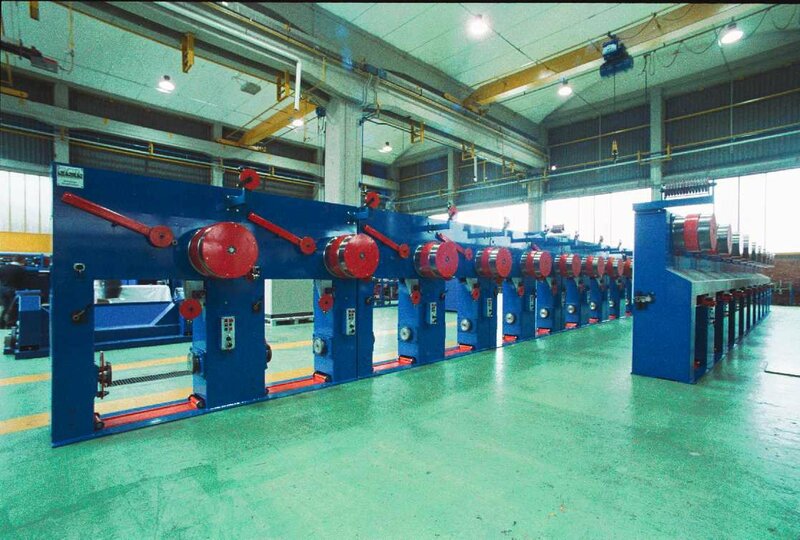 MRO type take-ups: these live coilers are designed with horizontal axis. The wire is accumulated on a horizontal axis capstan and then directed to an inclined carrier that rotates at the same speed of the capstan. This type of unit is particularly suitable for large diameter wires. AP/DB type take-ups: These units are very compact and are equipped with an horizontal axis double block type accumulator. The accumulator will load itself with wire while the spool is changed and will unload itself by accelerating the spool for a limited time as soon as the new spool is loaded. 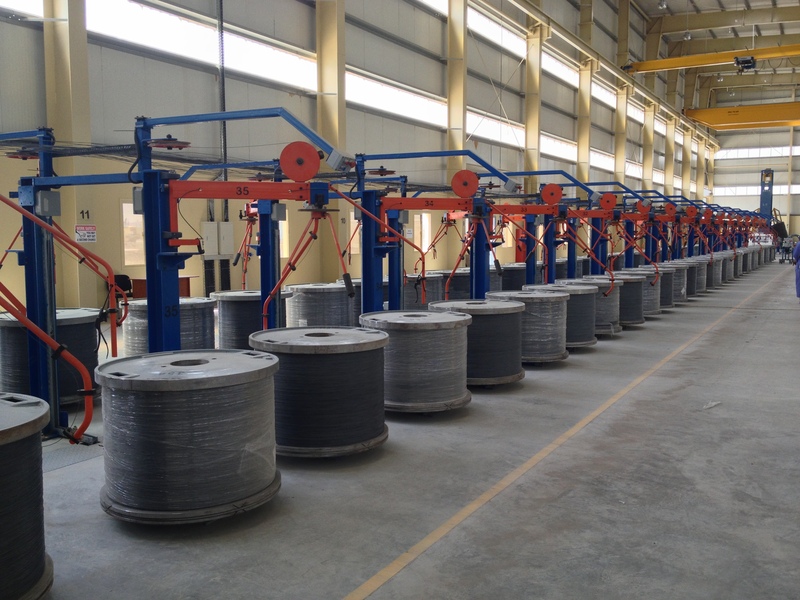 In this unit the spool is either mounted with horizontal axis positioned under the accumulator or with vertical axis with the accumulator being also vertical axis and placed nearby the spool. ABW take-ups, these high speed take-up units are specific to bead wire and are equipped with a large pulling capstan and straightening rollers in order to obtain straight wire. ABW/DB take-ups, these high speed take-up units are specific to bead wire and are equipped with a large accumulator pulling capstan and straightening rollers in order to obtain straight wire. The accumulator allows to store the wire while the spool is being changed but the line has to reduce it's speed.